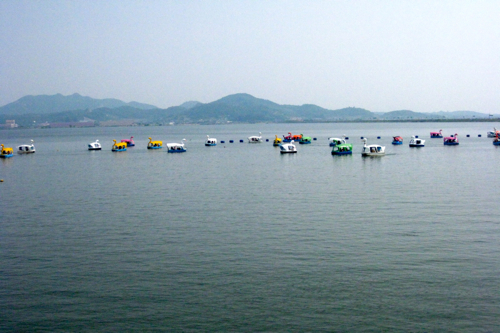 This blog post is part of a series highlighting my month-long family trip to Korea and Japan. 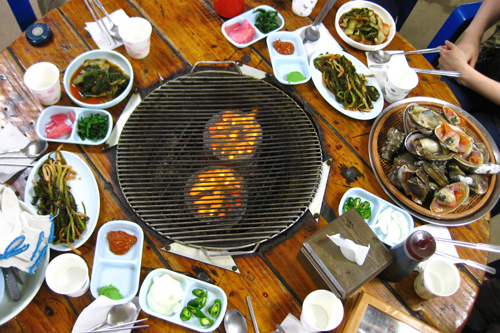 This is the third installment of dining in Korea. 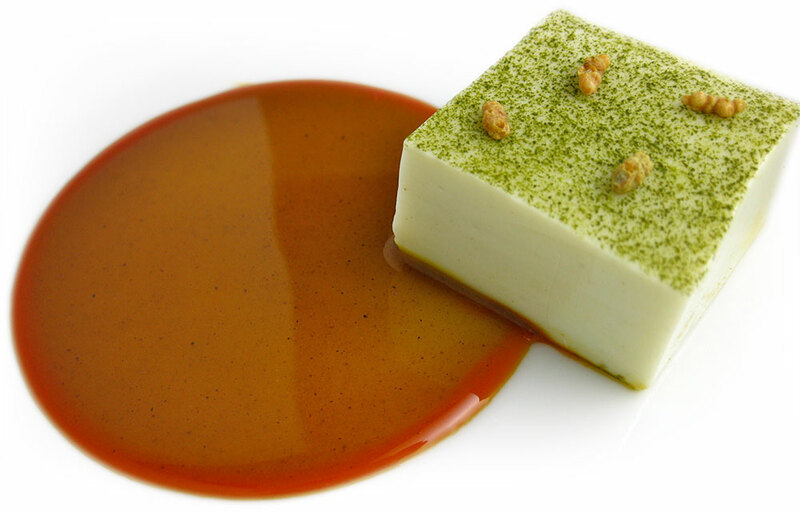 You can also read up on my First and Second Meal in Korea, as well as my First and Second Meal in Japan. 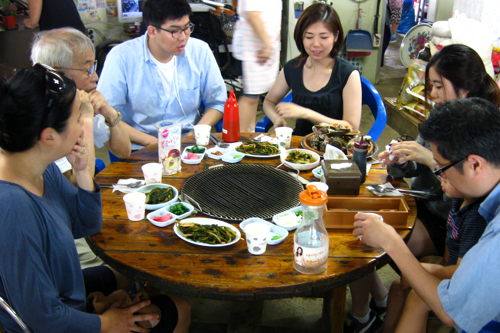 With Ginhee’s parents each coming from families of five siblings, there are many aunts, uncles, cousins, and other extended family members living in Seoul… and everyone wanted to make sure we had a diverse cultural experience during our visit. 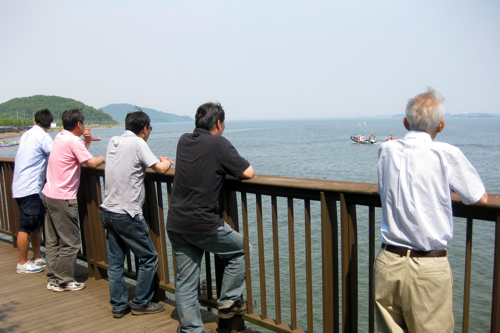 Since nearly every event involves a meal, and with Korea surrounded by ocean, such a cultural experience must include a day trip to the coast for seafood. Shellfish tanks lining the entranceway are only a moment away from the table. After sitting in the car for a couple hours, the first order of business was lunch. 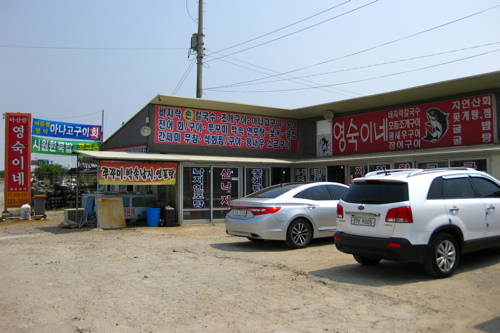 We drove past numerous seemingly identical roadside restaurants, until we suddenly turned and parked at one. “This is it!” Ginhee’s uncle exclaimed. 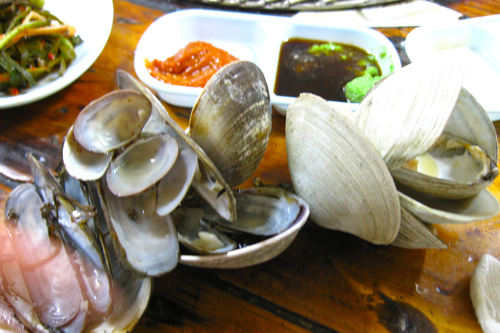 He continued to tell me how this place was best known for their freshly caught abalone, whelk, and clams. From the outside, the restaurant looked pretty nondescript, with signs in Korean advertising its menu from all sides, just like every neighboring spot. Right behind the restaurant was the ocean, which was out in the distance since it was low tide. We were ushered inside, past the numerous shellfish tanks, to dining tables which had an open space in the center covered by a grill. 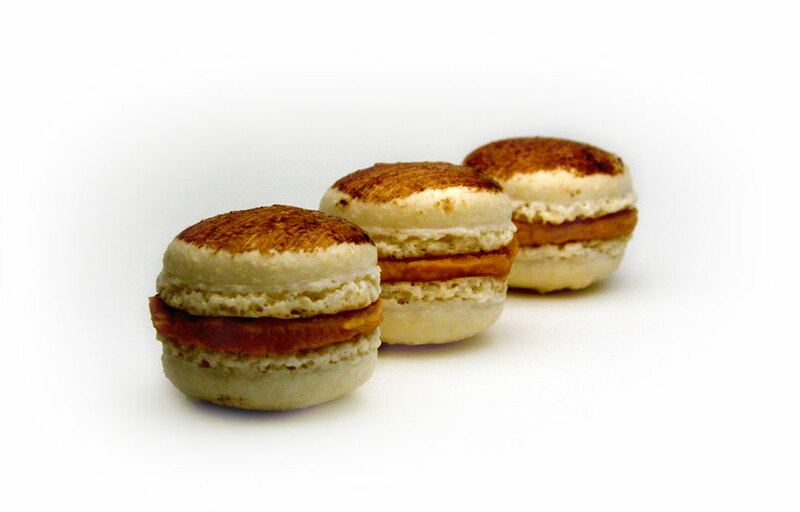 There really wasn’t too much of a menu, just their specialty items, so once we were settled the food started to arrive. Cutting kimchi tableside, since the cabbage is fermented whole. Of course I had no idea what we were in for, but that was all part of the adventure. 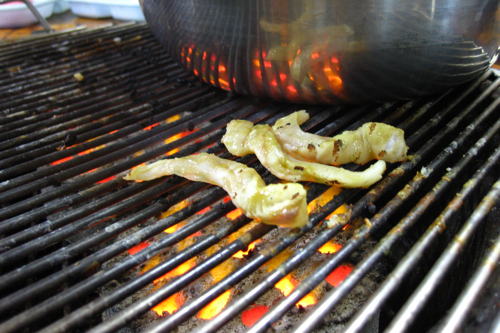 A server came to the table with long tongs holding large charcoal briquettes, glowing with intense heat, and placed them underneath the grill. 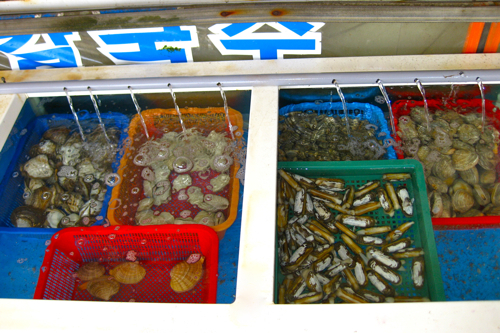 Baskets of shellfish soon followed, placed around the table. Everyone leaned away as the intensely burning charcoal briquettes arrived. 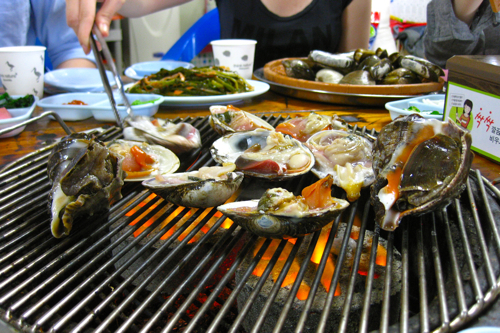 Taking our cues from Ginhee’s family at the next table, we began to line up some of the shellfish directly onto the grill. 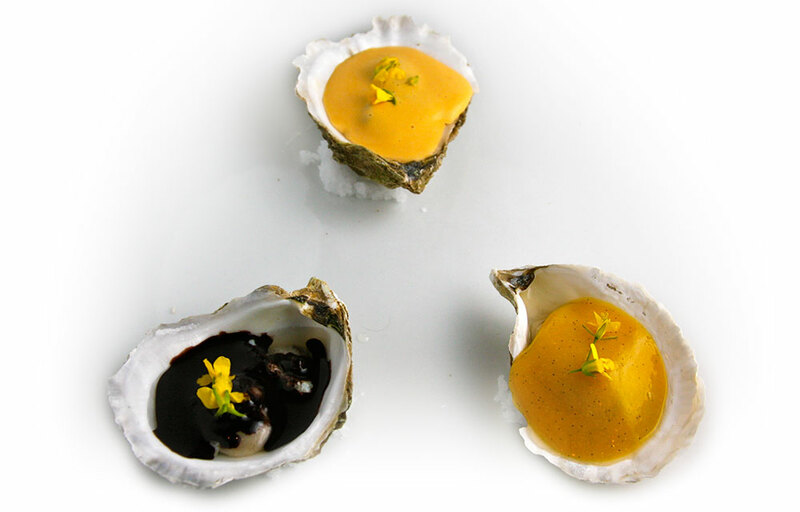 It immediately sizzled as steam from the juices in the shells filled the air, creating an intoxicating aroma of charred seawater. Within a couple minutes, you could see the meat start to bubble and cook in the shells. We were instructed to start eating once the meat turned opaque and firm. 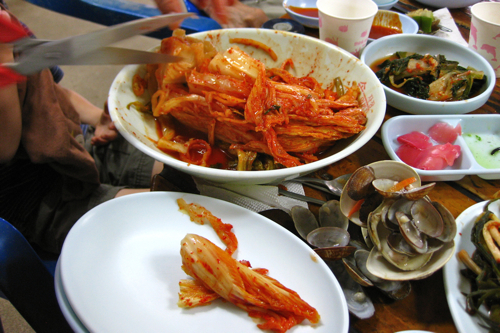 The shellfish were incredibly hot to handle, but using chopsticks helped scoop out the meat. 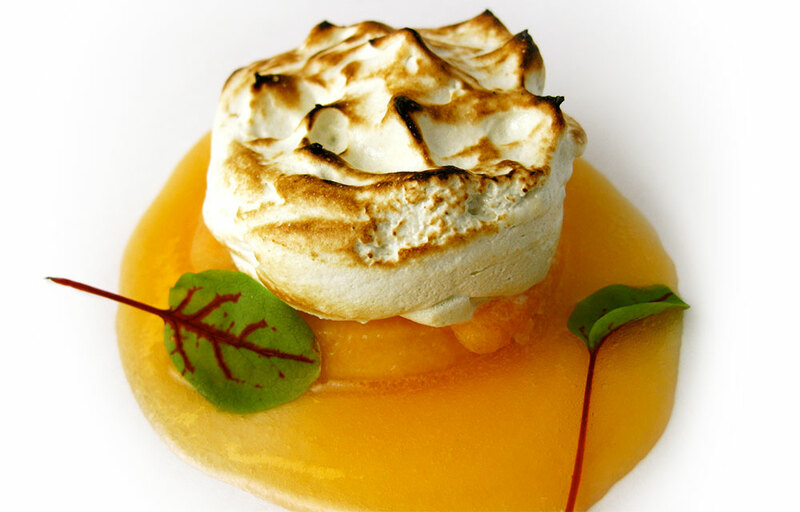 The taste was an incredible combination of sea and smoke like I had never had before. 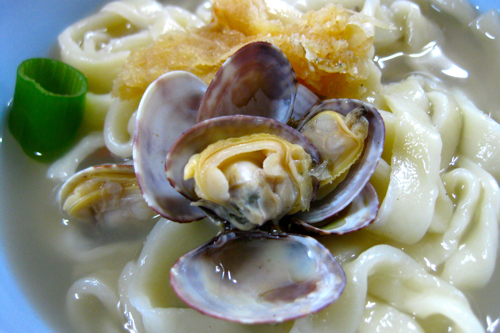 … placing whelks at the edges, since they take much longer to cook. Coming from Boston, I was not new to shellfish and quickly realized I liked mine cooked much less. 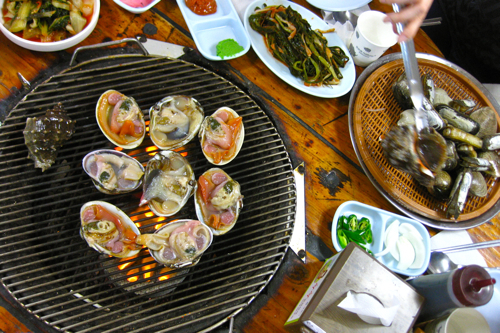 Soon I was simply warming the clams through on the grill before slurping them down… not without a few hairy eyeballs glancing my way… but all worth the fresh-from-the-ocean-grilled deliciousness. Piles of discarded shells accumulated around the table. As I began to think I couldn’t possibly consume any more grilled shellfish and kimchi, out came generous bowls of noodle soup to be shared by the table. These hand cut noodles (called kalguksu, which literally means “knife noodles”) were perfectly chewy and mixed with even more seafood in a light, flavorful broth. But I’ll be damned if something as trivial as “completely full” is going to stop me from indulging in one of my absolute favorite dishes. Cooking “knife noodles” on the grill. 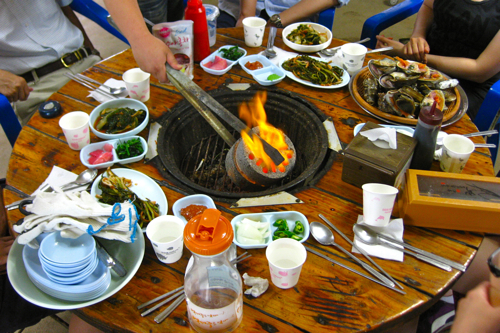 The temperature inside the restaurant was scorching with all of us gathered around the grill. 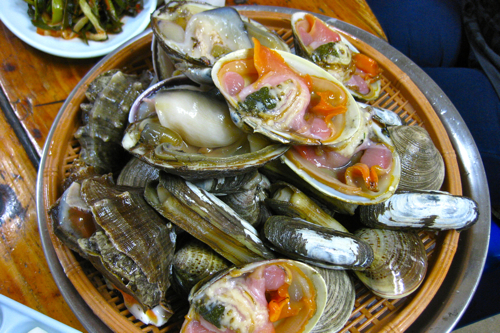 But this didn’t seem to diminish my appetite, as I continued grilling shellfish and slurping noodles, with the heat just adding to the competitive nature of trying to consume all this food around me. As always, Ginhee’s family made sure we had enough to eat, even ordering more food at this point. A platter of freshly sliced raw fish was delivered to our table and even though I could not imagine eating another bite, I simply couldn’t resist… even if just a taste. In my coma-like gluttonous state, I found the raw fish a bit chewy and hard to eat. Using what was at my disposal, I proceeded to dress the fish in soy sauce and then placed it on the grill. The fish actually tasted even better now and was much easier to eat. However, the once askance glances from my fellow diners now turned to “WTF? !” verbal opposition. Thankfully I was supported by my brother-in-law who, in solidarity, cooked up a few pieces himself and agreed it was worth it. No one else dared to try such a sacrilegious ruination of perfectly good raw fish. Post-lunch boat watching with the menfolk. 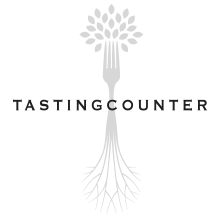 The dining experience was very rustic and truly authentic, especially in the way we were eating with the locals. I really appreciated the cooking method and simplicity of this meal, compared to the various menu options and dishes offered by most of the other Korean restaurants we had visited. 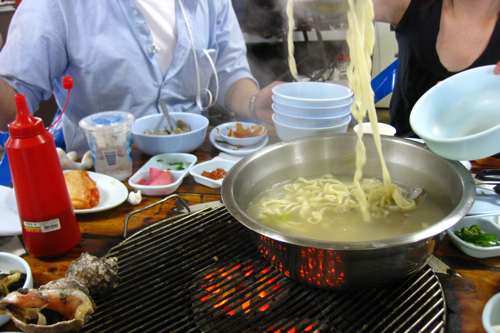 Although available in Seoul too, provincial restaurants are known for offering only one single dish as their specialty. 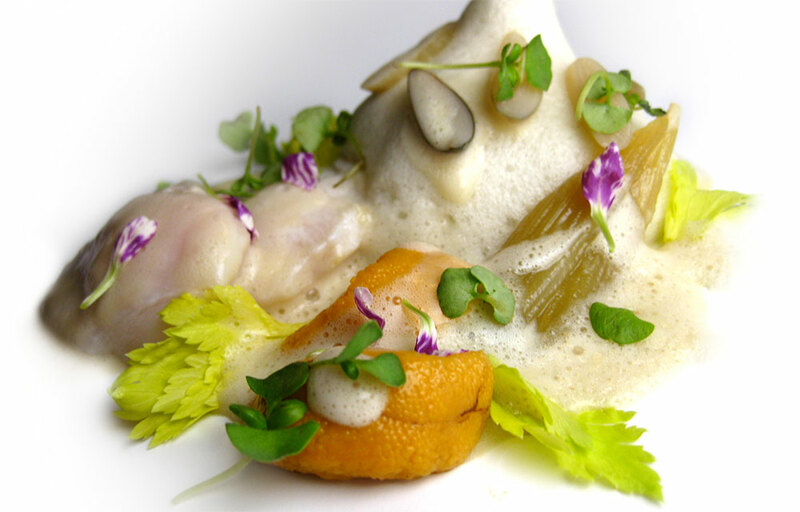 And this restaurant was a genuine example of that, showcasing the rich flavors of the ocean.